Tea threes are a way to approach your tea time enjoyment. Three seems to be a number that comes up a lot, so why not apply it to teas? Genies, when extruded from their lamps via the sufficient amount of polishing of the lamps’ exteriors, grant you three wishes. A great time to wish for your three favorite teas. I’d go for Yunnan Gold, an Autumn Flush Darjeeling, and a Tippy Assam. Three little pigs tend to build houses together, though they don’t always select the best building materials to withstand onslaught from huffing and puffing wolves. Now, if they had all built just one big house, they could have blithely enjoyed a most pleasant tea time inside while that wolf raged outside. A family of three bears, living peacefully in the heart of the woods, reported a home break-in one day to the forest ranger. From what I heard, it was a golden haired human girl who was caught asleep in the young son bear’s bed. 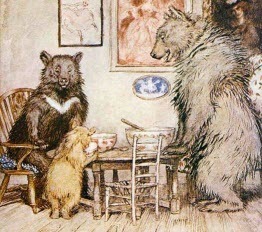 When awakened, she proclaimed, “But the bed was just right!” Mama Bear also reported that “Goldilocks,” the human girl’s alias, had sticky honey all over her face and hands and that there were several empty honey pots and cups of tea on the kitchen table by the bowls of porridge. Then there are the Three Musketeers. “The characters from the classic novel by Alexandre Dumas fils,” you ask, “or the yummy candy bar with the fluffy chocolate filling and the luscious chocolate coating?” “Yes,” I reply. Nothing like a bit of swashbuckling and rescuing damsels in distress to whet the appetite for a goody laden tea time. Chocolate is one of the best options here. So, buckle that swash, damsel that rescue, and sit down to a pot of oolong and some chocolate! Of course, you probably know the saying “third time is a charm.” It works for lots of things, such as trying out a new recipe (the first two times, that soufflé definitely did not look like the photo in the cooking magazine). Where tea is concerned, it means trying at least three cupfuls of a tea that at first you don’t like before you declare it a total loser. I realize there are some teas out there that will be pretty tough to do this with. Mostly, these are ones that have had various flavorings added to them. The old “one man’s treat is another man’s poison” sort of thing. But give ’em a second or even third try. I have found myself going “Mmmmmm… better than I first thought!” Of course, there have been a tea or two that were much worse the second and third time around. That’s life! So, give that loser tea another try, find a lamp to polish, beware of bear houses in the woods, and join those little pigs in a celebration of second and third chances!